A stretch of a major highway near the California-Oregon border will remain closed through the weekend as crews try to tame a roaring wildfire burning on both sides of the north-south route, authorities announced Friday. Jodi Hernandez and Jeff Ranieri report. A stretch of a major highway near the California-Oregon border will remain closed through the weekend as crews try to tame a roaring wildfire burning on both sides of the north-south route, authorities announced Friday. 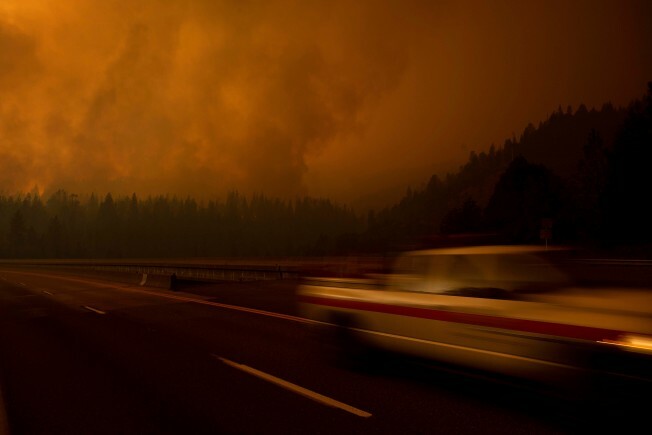 The blaze that shut down Interstate 5 on Wednesday was still burning out of control, said Denise Yergenson, a spokeswoman for the California Department of Transportation. "There is active fire close to the highway," she said. "There is lots of damage, lots of emergency personnel. It's just not a safe situation." Officials on Sunday will reevaluate whether to reopen the route that traverses the entire West Coast from Mexico to Canada and usually swarms with trucks and traffic. 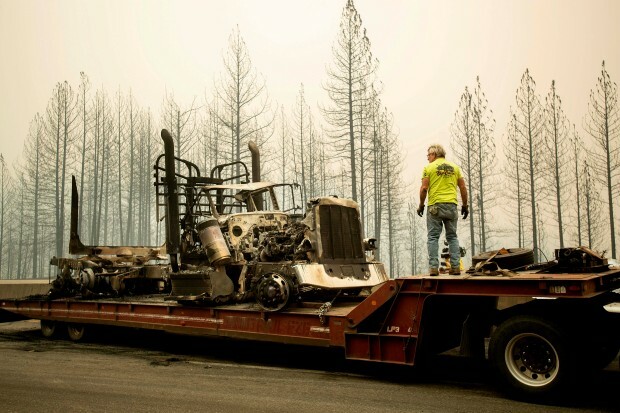 Truckers abandoned big-rigs and motorists screamed in fear as they came dangerously close to an explosive wildfire that shut down about 45 miles of a major California interstate near the Oregon border that authorities were desperately trying to reopen. Jodi Hernandez reports. It was a ghost road along a 45-mile (72-kilometer) stretch where fire swept down two days earlier and turned hills on either side into walls of flame. Drivers fled in terror and several big-rigs burned Wednesday. Before the highway is reopened, authorities have to check the safety of the pavement and cut down burned trees next to the road — some of them 70 feet (20 meters) tall — that might be in danger of falling down. 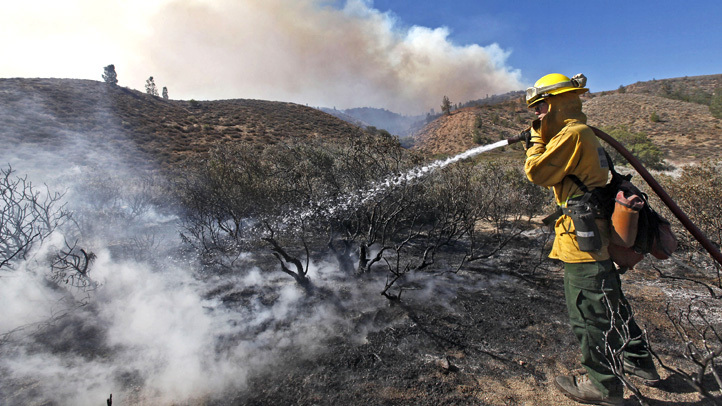 The fire had burned more than 34 square miles (89 square kilometers) of timber and brush and prompted evacuation orders for scattered homes and buildings in three counties in and around the Shasta-Trinity National Forest. At times, flames shot up 300 feet (91 meters) high. This map shows the Delta Fire perimeter, thermal hotspots and traffic conditions near the fire. Although the fire wasn't burning near any large towns, fire spokesman Brandon Vacarro said about 280 homes were considered threatened. There were some reports that homes had burned but Vacarro could only confirm that an outbuilding and two mixed-use commercial and residential buildings had been damaged. "It could be like a bed-and-breakfast, it could be a store with a house above it," he explained. Meanwhile, truckers who rely heavily on the I-5 to transport timber and other goods along the West Coast had the unenviable choice of waiting or taking a jammed detour that added 115 miles (185 kilometers) or so to their journeys. "The road is essentially all two lanes on that journey and there's some steep hills on there as well so obviously slow-moving trucks going up and down the hill is making it hard to travel," Vacarro said. Patience was running thin at the Pilot Travel Center in the town of Weed, near the northern end of the closure. The truck stop's facilities were stretched to their limits, cashier Jacob Chapman said Thursday afternoon. Parked big rigs lined the roads surrounding the facility. "It's been ridiculously congested. It's been frantic," Chapman said. "A lot of the truckers are upset. They're just stuck, they can't get through and they're sick of waiting around." 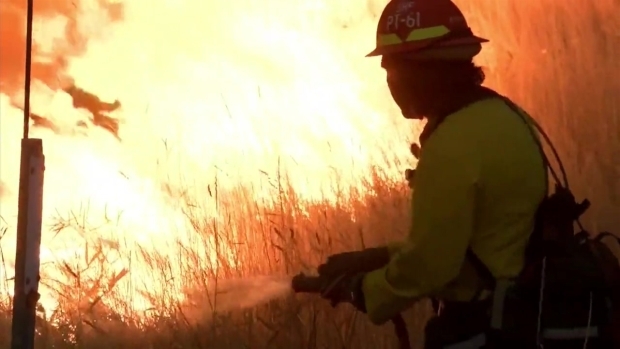 California has been hit with one massive blaze after another, including a blaze not far from the Delta Fire that last month burned about 1,100 homes and killed eight people. The unrelenting flames have drained California's firefighting budget and prompted nearly $1 billion in property claims even before the start of the dangerous fall fire season, officials said Thursday. The deadly Carr Fire and another in the Mendocino area — the two largest blazes in the state this year — destroyed or damaged 8,800 homes and 329 businesses, Insurance Commissioner David Jones said. Victims have filed more than 10,000 insurance claims so far, totaling $845 million. Also on Thursday, the director of the state's firefighting agency said in a letter to lawmakers that the agency only had about $11 million remaining in its annual budget and anticipates needing another $234 million to add firefighters and helicopters, and to cover other costs of fires expected later this year.